Patriotic music was a feature of the early stages of the First World War, and many of the most popular tunes were love songs, making an emotional connection between the troops and their families and sweethearts back home. Harmonicas were a common instrument amongst the troops of both sides, due to their size and durability. It was widely reported that the Christmas truce of 1914 began with the sharing of Christmas songs and harmonica music between the opposing trenches. Made for the 'Resonance' WW1 touring exhibition, 'They Didn't Believe Me!' exemplifies a growing interest in curatorship and an engagement with the evocative materiality of historic artefacts that emerged during the development of the exhibition. The piece contains a harmonica, excavated from the battlefields of the Western Front, a Crested China gramophone, a 78r.p.m record, and a collection of Bamforth and Co. song postcards. 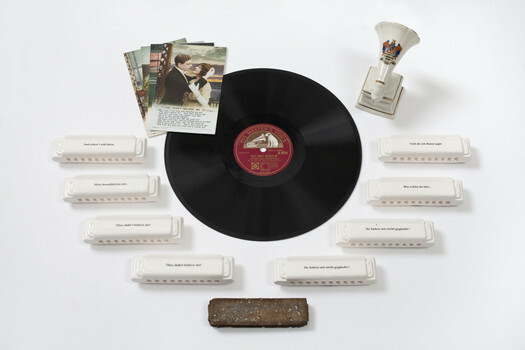 Responding to this collection of historic objects, and adopting the genre of Crested China, a series of slip-cast ceramic harmonicas were printed with the lyrics of the Jerome Kern classic “They’ll Never Believe Me” in both English and German, and these were shown alongside the historic artefacts.